This year, many families are fighting deportations and celebrating their last Christmas together. Others of us are spending the holidays with our families the only way we can: with calling cards, through Facetime, and by imagining that next year we’ll be together again. For mothers at Berks County Family Detention Center, a prison for migrant families outside of Philadelphia, the holidays are especially painful and isolating. These women crossed borders and deserts to escape violence only to be re-traumatized by border patrol and ICE agents. Instead of finding relief at the border, they were incarcerated. Michelle Angela Ortiz, a visual artist and community arts educator, has worked with mothers at Berks since March of this year. 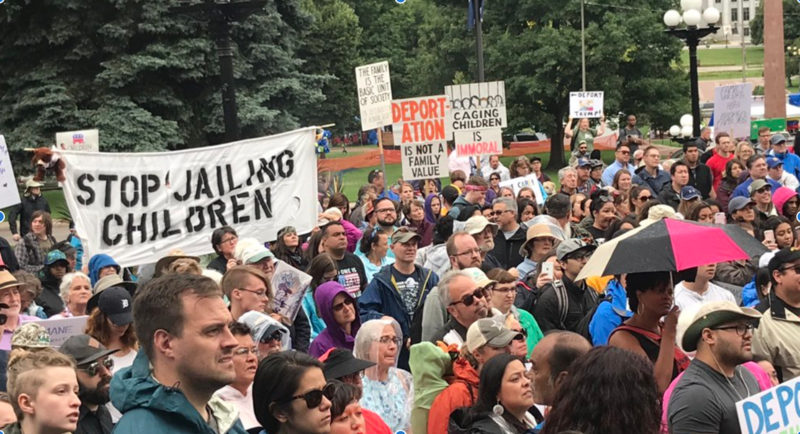 One of ICE’s three “Family Residential Centers (FRCs),” Berks has been charged with a laundry list of human rights abuses. There are records of mothers being raped by guards, children receiving inadequate education and medical attention, and verbal and labor abuse. Some immigrants were held at Berks for over two years along with their children – the youngest being nine weeks old – with many reporting suffering from depression and post-traumatic stress disorder (PTSD). The women at Berks have been fighting for their freedom for years, participating in hunger and labor strikes, and organizing letter writing and vigil campaigns. “Seguimos Caminando” (We Keep Walking) combines the mother’s words with Ortiz’s artwork. 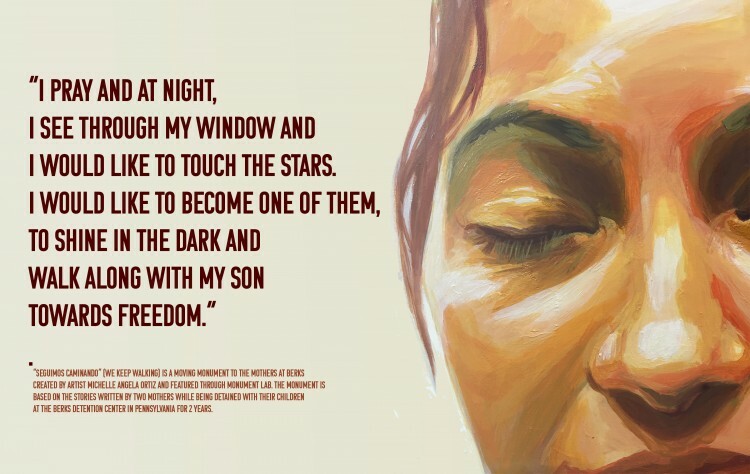 Sharing their hopes for freedom and the mental and physical toll of indefinite detention, Ortiz hopes to amplify the mothers’ voices and shed light on the trauma incarceration brings to black and brown communities. From October to November, the words and images were projected onto City Hall in Philadelphia, a creative act of resistance that not only inserted these imprisoned (and often, invisible) women into the public sphere but also placed them next to the statues and images of the founding fathers near City Hall. 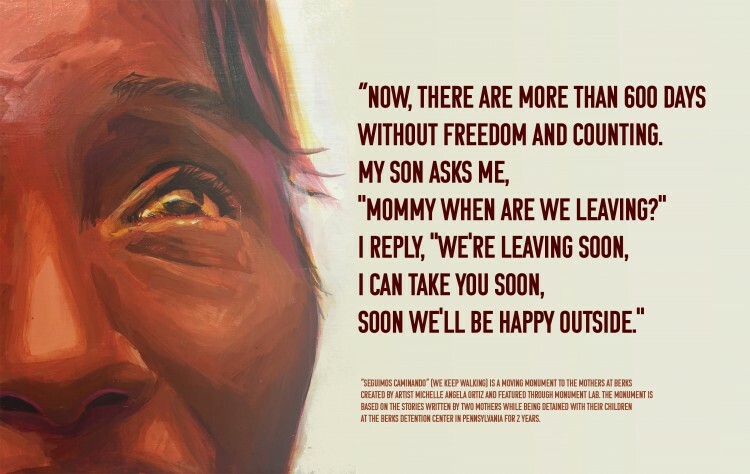 Ortiz’s art calls for freedom for these women and insists on their place in American society, claiming these women are equally as deserving and worthy as the men credited with founding the nation. Earlier this year, the mothers Ortiz worked with were released from Berks, although they are still required to report to ICE regularly, wear probation bracelets, and pay a $820 fee to gain a work permit. Other mothers are still locked up at Berks and being forced to spend the holidays away from their families, enduring physical and emotional abuse, and being treated as criminals rather than as asylum-seekers. I spoke with Lorena, one of the released mothers, who told me that her release was the best Christmas present she could have received. Rather than being confined in a prison and kept from leaving the premises, this year, she was able to walk outside, take her son to see a Christmas tree, and see a smile on his face. The fight for women’s freedom from immigrant detention is far from over. This holiday season, take a moment to sign the petition to shut down Berks and, if you’re able, make a donation to support the mothers who were recently released – including Lorena. Header image via Michelle Angela Ortiz.